The eastern coastline of Tasmania is one of the most wonderous places I have visited, either in Australia or overseas. The scenery above the water is simply spectacular in spots, and just brilliant everywhere else. There are no cities along this section of the coast, only a few small towns. Probably the pick of the towns, at least as far as Kelly and I am concerned, is Bicheno. Bicheno is located 177 kilometres north-east of Hobart and it takes about two hours to drive there from the City (a bit less from the airport). 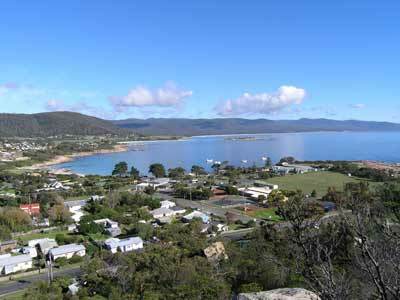 Bicheno, like a lot of old towns on the southern coastline of Australia, was a whaling town. Luckily that era has ended and it is now well known for its diving and wildlife. All the diving here is done within a few hundred metres of the boat ramp. There is a series of rocks off the ramp that create a small protected harbour and channel. The outside of the rocks is where the vast majority of the diving is done. When Kelly and I dived here we dived with Bruce from Bicheno Dive Centre (the only operator). 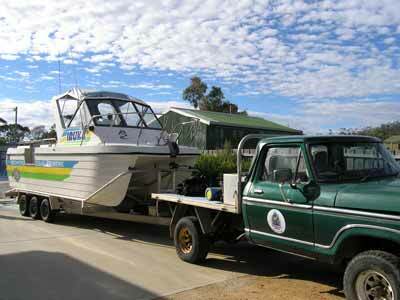 After putting our gear together and onto the truck, you get into your wetsuit and are driven down to the boat ramp. Here you load the tanks etc onto the boat and climb aboard. The boat is launched and within a couple of minutes you are at the dive site. The boat is a large cat that has heaps of room and is very stable. You get a great dive briefing and there is a guide on all dives. After the dive you return back to the shop in the shop's vehicle and unload and wash your gear. There is even a hot shower outside to wash yourself (and your wetsuit). There is a load of hanging space to dry everything after the dive. There is basic accommodation at the dive shop. In town, there are a number of motels to pick from. As well, you can rent a house as we did in February 2009 when we went there again with our dive club. There are quite a few cafes and restaurants, our favourite the first time was Rose's but the second time it was not too good. The bakery was much better, with good pies. There is a supermarket, a butcher (fantastic but expensive sausages) and other shops so you can cook your own. Other things to do are to walk to the lookout east of the town centre (good views over the dive sites), go to the wharf and look for penguins (we saw one a few metres off the wharf) and drive to Freycinet National Park and do some walks (great for your last day before flying home, do the Wineglass Bay walk and then across to Hazard Beach and back via the coast - see my 4WD article for photos and information). Finally, Bruce is one of the friendliest dive shop owners I have ever met (and I have met a lot) and I well recommend his services. Click here to read some more about the dive sites.